This kit has 3 bearings that will work on most in-ground pool pump motors. You will only use 2 of the bearings. The kit will fit the 56 frame and some of the 48 frame standard residential pool pump motors. The kit includes 2 #6203 Bearings and 1 #6304 bearing. 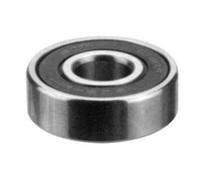 Bearings are not of premium quality, but they are manufactured to many motor specifications. I recommend that replacing bearing should be done by a professional motor repair serviceman. But we have sold bearings to pool owners and they have installed them. Replacing a bearing should not be a rush job and if you are not confident, take the motor to an electric motor repair service center. The kit does not include 2 of the bearing number 6201Z, which is found in some older Power Flo above ground pumps. The older Power Flo's are very difficult to change the bearings and it is usually better to replace the motor in the Power Flo pump(old & new)than replace the bearings.